During January 2006, a salvage excavation was conducted on Ussishkin Street in ‘Afula (Permit No. A-4671; map ref. NIG 22736–40/72367–71; OIG 17736–40/22367–71; Fig. 1). 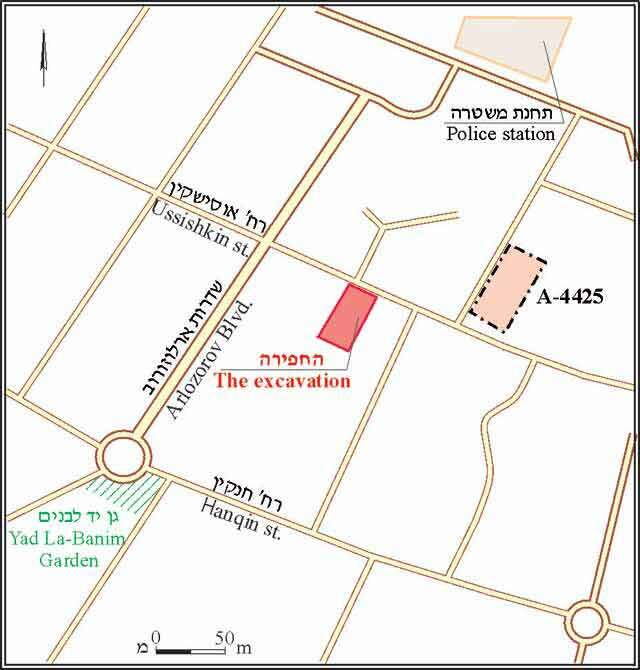 The excavation, on behalf of the Israel Antiquities Authority, was directed by E. Amos (surveying and photography), with the assistance of Y. Lavan (administration), N. Getzov (guidance) and H. Tahan (drawing). Remains dating to Iron I and the Persian and Byzantine periods (HA-ESI 114:27*; ‘Atiqot 30:25–67) were exposed in the area, as well as remains from the Early Bronze Age until the Mamluk period (Permit No. A-4425). 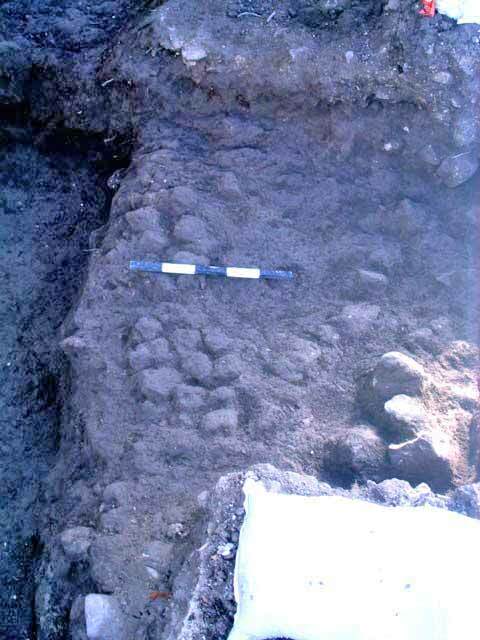 One and a half excavation squares (c. 35 sq m) were opened, revealing a floor bedding of fieldstones that was dated to the Early Islamic period (Fig. 2) and two layers of fill from the Early Roman and Late Hellenistic periods. Potsherds from the Late Hellenistic period, Intermediate Bronze Age and Early Bronze Age were found. The subterranean water level flooded the excavation area and prevented the continuation of fieldwork. Stratum I (Early Islamic period). 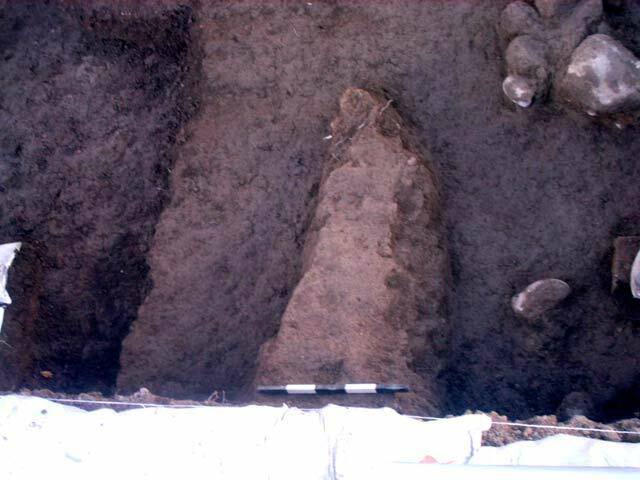 Most of the excavation area was covered with a layer of fill that consisted of light color earth (L3). The layer contained numerous potsherds from the Early Islamic period, including an open cooking pot (Fig. 3:1) and a holemouth jar with a thickened rim (Fig. 3:2). A floor bedding of medium-sized fieldstones (L10; Fig. 4) was also ascribed to this stratum. Stratum II (Early Roman period). This stratum comprised a layer of light brown clay soil, similar to mud-brick material, which was found in non-contiguous sections mostly in the northern part of the excavation area (L5; Fig. 5). Many potsherds from the Early Roman period were found, including a Type 3A Kefar Hananya cooking pot (Fig. 3:3), jars with a high neck (Fig. 3:4–6) and a pared lamp (Fig. 3:7). Stratum III was a layer of dark brown soil (L7) that contained a very large number of potsherds from the Early Roman period, as well as from the Late Hellenistic period, including a cooking pot (Fig. 3:8) and a jar (Fig. 3:9). The strata were damaged by later pits (Loci 2, 8) that were probably used as septic pits and contained ancient buildings stones together with modern material. Potsherds from the Late Hellenistic period, Intermediate Bronze Age and Early Bronze Age were found throughout the excavation area, probably alluding to the presence of settlement strata from these periods. It was not possible to verify this theory because the excavation was suspended due to the flooding of the subterranean water level. 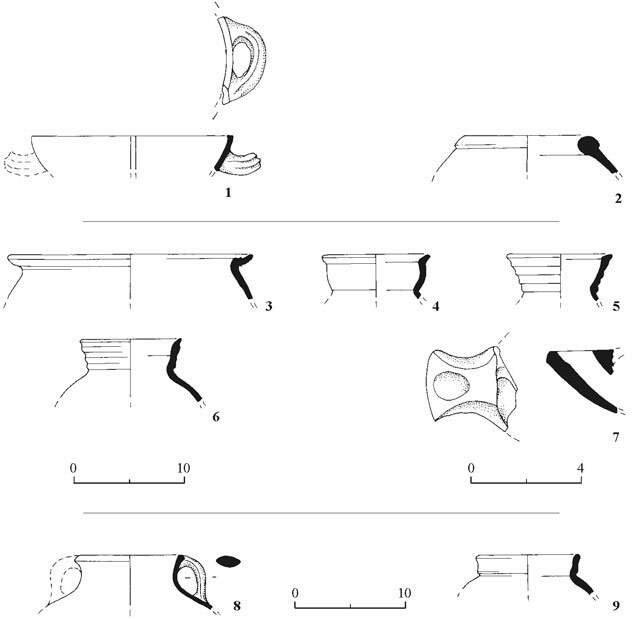 Previous excavations at Tel ‘Afula and its vicinity have shown that the region of the police station (see Fig. 1) lies within the northwestern precinct of the ancient tell. In this region numerous remains that ranged in date from the Late Hellenistic until the Mamluk periods were found. The area of the current excavation was expanded westward and its results are likely to aid in determining the scope of the settlement at the site from the Hellenistic period onward. 4. Floor bedding, looking south. 5. Layer of light color accumulation (L5) and layer of dark accumulation (L7) below it, looking south.